Red Velvet Cake recipes are probably the most popular of southern desserts. 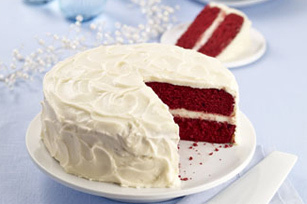 This classic cake is a unique, vibrant red cake with creamy white frosting. Good for any occasion and especially festive for a Valentine’s Day or Christmas dessert. This cake was a signature dessert at the Waldorf Astoria Hotel in New York City during the 1920’s. According to common urban myth, a woman once asked for the red velvet cake receipe, and was billed hundreds of dollars. Indignant and wanting to get even, she sent the cake recipe to all her friends and encouraged them to circulate the recipe. When working with food coloring, be sure to wear an apron to protect your clothes and you might even want to wear disposable gloves when working with the red food coloring if you want to avoid red hands. Easy Velvet Cake Recipe is an enhanced cake mix recipe with an easy cream cheese frosting. The Original Cake Recipe is a traditional two layer cake with cooked frosting. Homemade Red Velvet Cake Recipe is an easy three layer cake made from scratch. Velvet Pound Cake is a moist, buttery pound cake with a cream cheese glaze.